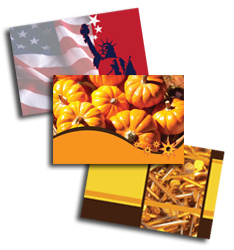 Postcards are great tools for appointment reminders, product launches are trade show handouts. Choose to have your post card imprinted identically on the backside or leave tour postcard backside blank for a customized message. Many clients customize their backsides with variable text output from their printers. Our Crocodile post card backsides are left uncoated with the result that backsides can be easily penned or printed. Inks from ink jet printers and postage machines actually dry and will not smudge.